If you’ve ever interviewed for a job you know the jitters that come as you sit across from a potential employer, the questions that run through your head as you answer various questions. Do they think I’m qualified? Was that answer dumb? Will they hire me? The first week of every Job & Leadership Training session here at Mission: St. Louis is riddled with the interview jitters, excitement and nerves. The new class of men arrive for their first Wednesday morning at our office. After a briefing about interview etiquette and a session of mock interviews with our staff, they will spend the morning at our internship fair, using their freshly learned skills to discuss their passions and abilities with potential employers-- St. Louis businesses and organizations that share a vision of transformation for our city. It always has and always will be one of our greatest privilege to partner with other organizations and businesses around St. Louis. While we’ve had support come in countless ways, having so many sites that have hosted/currently host internships for our men in JLT to gain professional experience is encouraging. Our internships allow companies to participate in our mission by empowering men with the opportunity to work despite their backgrounds. It creates opportunities for our guys to demonstrate their skills and work ethic as employees while receiving valuable training and feedback from their supervisors and the JLT staff to take into their future employment. One of the local businesses we have the privilege of partnering with is Affiliate Merchandising Group. Near the Mississippi, a three-story green warehouse that hosts Affiliate stands tall. The building’s insides boast a modern and sleek screen-printing business, packed full of machinery, a bustling, personable staff, as well as a few friendly company dogs. Affiliate joined our team of partners recently, offering internship opportunities of all kinds. Gerad Ewing, CEO, began Affiliate as a college student, designing and printing shirts for sororities on campus. Since graduating, his small business has grown to be the largest consumer embroider in Missouri, designing, printing and distributing high quality shirts to a variety of groups including the NCAA. 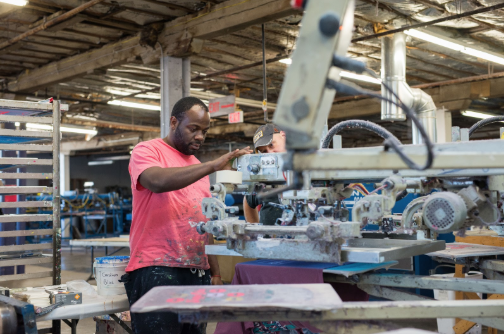 During the Fall 2018 JLT session, men who interned at Affiliate took on learning the art of printing merchandise for various clients as well as maintaining their massive workspace and machinery. Three of the men who interned at Affiliate excelled in their work so much so that after graduating, they were hired on for full-time employment. Eddie is one of those grads. He is reserved, gentle and quietly inviting. His role at Affiliate is maintenance-focused, as he stacks and sorts orders and performs general day-to-day tasks at the warehouse. A few months previously, Eddie met Ryan Palmer, Beyond Jobs VISTA at Mission: St. Louis, and told Ryan that he wasn’t quite sure he wanted to check out JLT-- he really didn’t think he needed it. After a few minutes of talking with Ryan, really assessing how hard it had been for him to get a job with his record, he decided to give it a chance. When he attended the JLT internship fair, Eddie came in with t-shirt design experience. He had designed and trademarked a few t-shirt designs of his own and already had the dream of putting these talents to work. First on his interview list was Affiliate. Because Gerad chose to believe in Eddie’s dream and give him opportunity to show off his skills, Eddie is thriving at Affiliate. Today, Eddie has been promoted to a position where he will be running the printers himself. The printers are massive pieces of machinery that require a lot of skill and knowledge to use properly and safely. Along with his new promotion and training, he has now set his sights on going back to school to get his GED, and after that continuing his education in the process of designing and printing apparel.